It’s an excellent summation of the band itself. 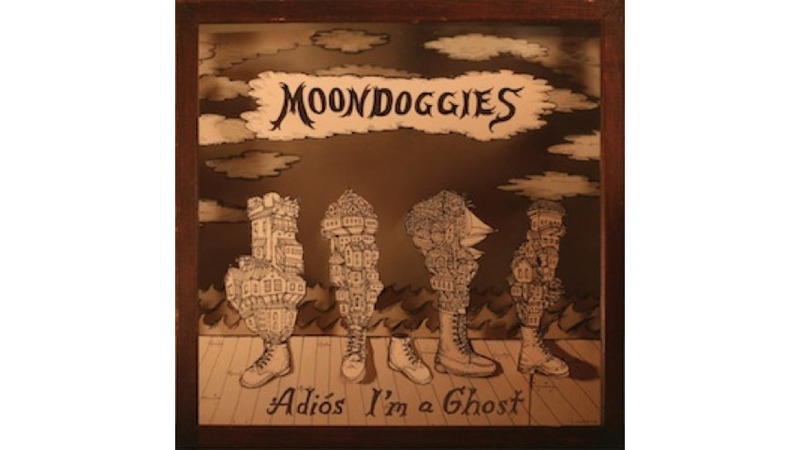 Veering effortlessly between haunting, atmospheric numbers and brassy, Americana-inspired rock (sometimes within the same song), Seattle’s The Moondoggies’ third release is the soundtrack of a broken heart attempting to repair itself by simply moving forward and rocking as hard as it can. Led by lead singer Kevin Murphy’s highly emotive voice, however, Adiós I’m a Ghost manages to retain its humanity and emotional center even in the most blistering of numbers. It’s enough to safely place the band head-to-head with the likes of their contemporaries, including Dawes, Blitzen Trapper and The Head and the Heart. While many of the songs approach or move past the five-minute mark, the result, unlike other similarly themed neo-Americana bands, rarely ever feels like overkill. Just when you think the band has settled into a favorable groove, as with “Midnight Owl” or “Back to the Beginning,” the song will suddenly switch it up and head in a different direction. After the opening punch of “Red Eye,” “Annie Turn Out the Lights” serves as a nice palate-cleanser. A steady, yet lovely track, “Annie” highlights the band’s effortless skills when it comes harmonies. The sparse “Pride” serves as perhaps the album’s most heartbreaking track. Over a delicately plucked acoustic guitar, Murphy takes on the persona of a man undone by his sense of pride. “The winter months came and the chill set in/ spent a northwest winter wonderin’ how you’ve been,” Murphy sings as the rest of the band harmonizes like far-away ghosts behind him. “A Lot to Give” is a curious track. Feeling like sludge rock filtered through a My Morning Jacket-esque aesthetic, the song pounds along with several complementing guitars before concluding with some strangely muted drum work. Though certainly fascinating in its own way, the six-minute production remains perhaps the only track where one begins to feel the length. Especially when sandwiched between the aforementioned “Pride” and the equally lovely, mid-tempo number “Stop Signs,” “A Lot to Give” feels like a whiplash-inducing detour.